After seeing this awesome pin on pinterest, I decided that my old boring parent letter must be redone! The old one was two pages long and full of syllabus stuff. Now, I work very hard on my syllabus and it's full of good stuff, but let's be honest, when a parent gets TONS of "sign here, and here, and here..." during the first week of school all that good stuff doesn't get read. So I boiled it down into an easy-to-read format that hopefully will get read! I hope you're having a fun time preparing for the upcoming school year. Let's make it a great year together!! Love the handout! 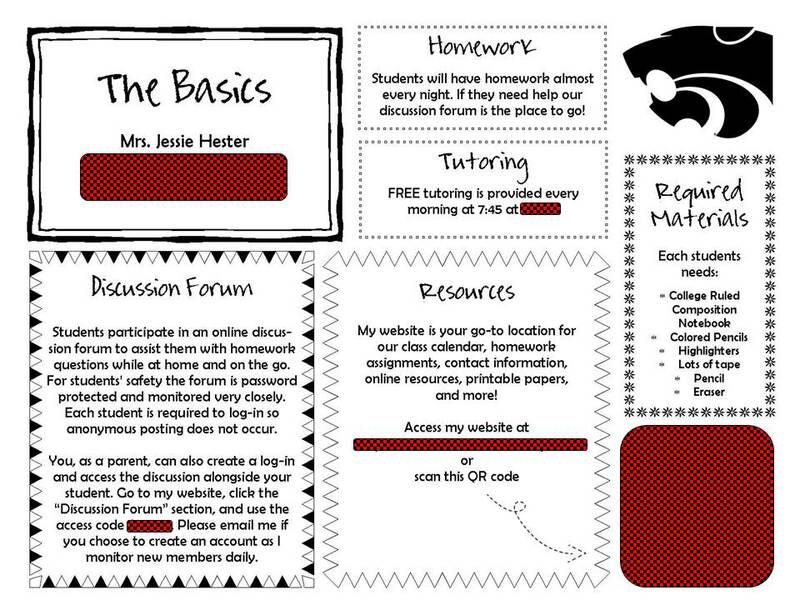 I'm interested to know what platform you use for your classroom website, and more specifically the discussion forum. I'm currently using weebly for my classroom website. Thanks Kim! I also use weebly for my classroom website - love it! I use Piazza for my discussion forum. I know there are lots of options out there and I chose piazza for a few reasons. 1) it supports math type so my students can easily type their questions and responses including math symbols/equations. 2) it has an apple and android app, allowing my students to keep updated from their devices. 3) it is password protected for safety. 4) it includes polls so I use that feature both during class and outside of class. You should definitely check it out if you're interested in a class discussion forum! Thanks for sharing! I will definitely check out the app. Sounds perfect! Would you be willing to share your template for this handout? I too would like the template. This site is amazing. I'd love a copy too if possible. Thank you! Hi! This looks soo great! Yes I agree less words and more focus on the most important stuff is so key! I am a teacher in Baltimore city and I would LOVE to use this template if you are still willing to share? My email address is jprovide.jp@gmail.com Thank you so much!! I would live to use this template as well and wondering if it is still available to share? My email address is kellyegreen6@gmail.com Thank you! !